Pat is available to play house concerts and other concert venues as a solo, duo, or trio. 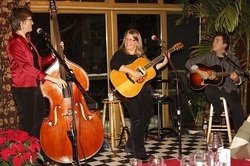 Usually partnering with Pat McLaughlin, and Ann Downey, you'll love the dynamics of their performance - expressive lead vocals, beautiful harmonies, and wonderfully tasteful and energetic instrumentals. To book a concert contact Pat.